Oh, I love my coffee time. Fresh brewed coffee topped with cream is always what makes my day. I usually skip breakfast or let’s say I prefer a late one, but I always have a slice of cake with my coffee. As I had too many store bought chocolate bars lately and with the luxury of two days off, I was already dreaming of my morning coffee in a day off. 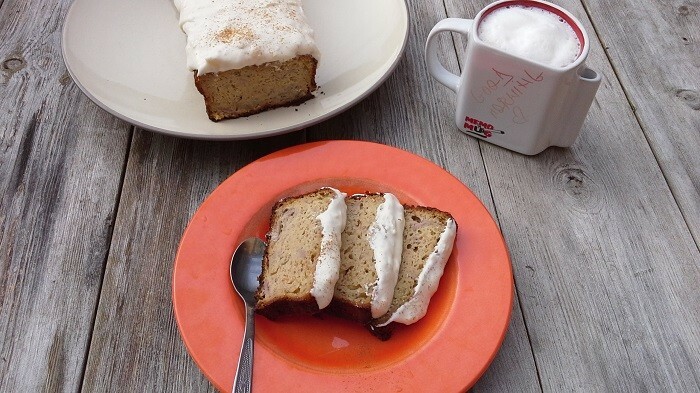 A moist slice of banana bread with ginger frosting. That’s what I want with my coffee. And it has been on my to-do list for quite some time. It’s time for something healthy and tasty. 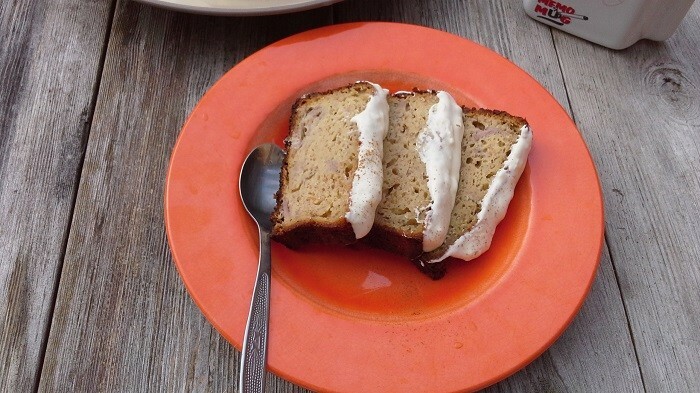 For perfect flavored banana bread you need ripe bananas. If overripe, it’s even better! I like to use brown sugar. It gives a nice caramelized flavor and my secret ingredient, for when it happens to have it in my cupboard, almost all the time, apricot jam. I think it’s a very tasteful combination. It just goes well together. Chia seeds are optional, but lately I am using these seeds in almost everything! And it doesn’t change the taste. It just gives a nutty hint. ½ cup unsalted butter, 4 eggs, 2 tbs sour cream, 4 ripe bananas, 2 tbs apricot jam, 1 tbs cinnamon, vanilla extract, 1 cup brown sugar, 1 tbs baking powder, 2 cups flour, 2 tbs chia seeds. Grease the inside of a loaf tin with a little butter. Beat the butter with the sugar, vanilla and eggs. 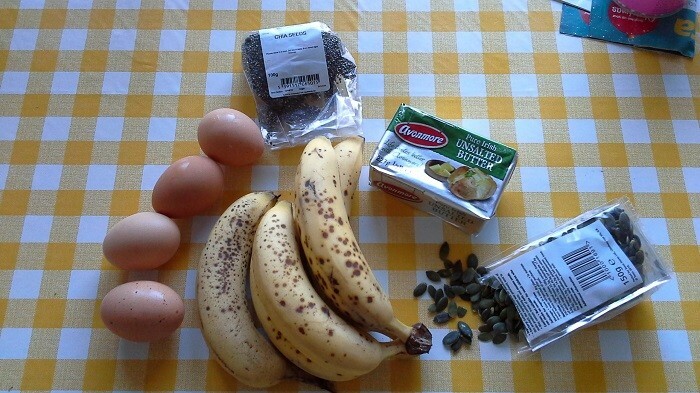 Add dry ingredients, chia seeds, then the mashed bananas, sour cream and jam. Mix well with a spoon or spatula. Bake at 180 degrees for about 1 hour. 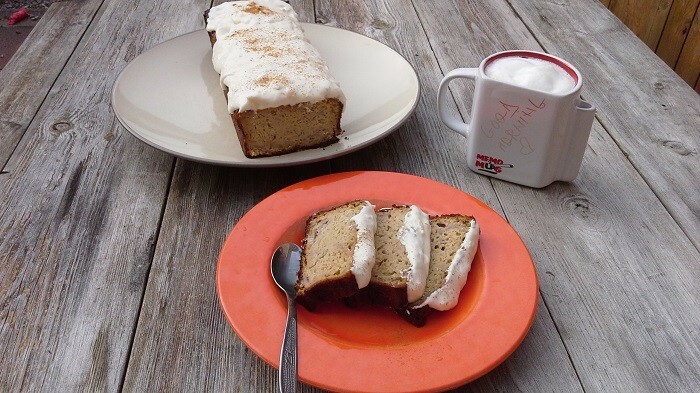 You can have your banana bread with or without frosting. But I like to give it a spicy twist and ‘’dress’’ everything in a rich ginger frosting. 1 tbs butter, 4 tbs cream cheese, 2 tbs double cream, 1 cup powdered sugar, 2 teaspoons finely grated peeled fresh ginger. If you don’t like the ginger, but you still want to give it a kick and you feel adventurous, you can replace the ginger with lemon or orange zest. Using electric mixer, beat double cream, cream cheese and butter in large bowl until smooth. Add powdered sugar and ginger; beat until fluffy and smooth. Cover and chill. Bring to room temperature, and then beat until fluffy before using. It’s a must try recipe.